We believe that God wants us to work with our fellow Christians of other traditions and our sister churches across the world and to share our resources. Our congregation is committed to working ecumenically with neighbouring churches of other traditions, and also strengthening our links with Reformed churches elsewhere in the world. Our congregation is active in Churches Together in Marston. Strong relationships have been developed between the Reformed, Anglican, Roman Catholic and Free Evangelical churches in the neighbourhood. The highlights of the ecumenical year are the open air service outside the shops on Good Friday, and the joint carol service (generally standing room only – so come early and be prepared to raise the rafters!). This latter is followed by a fellowship meal. Each month a Semi-Quiet Day is organised on an ecumenical basis by the Sisters of the Convent at Harberton Mead. Each year a committee drawn from all the churches in Marston prepares the Womens' World Day of Prayer Service held on the first Friday of March. Study groups are organised on an ecumenical basis during Lent and Advent. 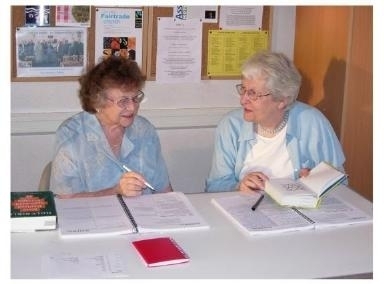 In addition the Marston churches share in a joint monthly ecumenical service in a local old people's home, which gives an opportunity for Christian worship to a number of people who otherwise would be deprived of it. We also make our premises available to another congregation in need of space in which to worship. Friday: Youth Fellowship from 7.30p.m. This group which has roots in Argentina, has a lively style of worship in the evangelical tradition. Internationally as well as locally we are aware of our links to the wider Reformed tradition through both the World Alliance of Reformed Churches and the Council for World Mission. Marston has strong connections to the Waldensian Church particularly the congregation at Pinerolo in Northern Italy. A number of our members have been to Italy to visit the Waldensian churches at Pinerolo and elsewhere. There is also a long-standing connection to Kilwinning Congregational Church in Scotland.